This transmission has been designed for street performance and other applications where tire spinning shifts are desired. 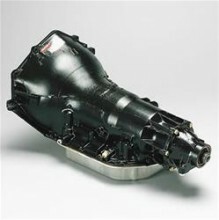 The street/strip transmission contains racing components which increase strength, reliability, and torque capacity. All street/strip transmissions also feature our manual/automatic valve body which allows you to select precise manual shifting or full automatic. Installation -- All linkage, vacuum lines and kickdown mechanisms must be connected and properly adjusted for any automatic transmission to operate correctly. We recommend the use of a Hughes Performance trans. cooler and deep aluminum oil pan, which has 2 to 4 quarts of extra fluid capacity, with any severe-duty, street/strip transmission. We also recommend the use of a cooler with the use of any high-stall torque converter application.